Waiting in the early light of dawn for the birds to wake up and the action to start at the Bosque ponds, I heard the whistle of a freight at the crossing up in San Antonio and got an idea. These freights aren't terribly fast. 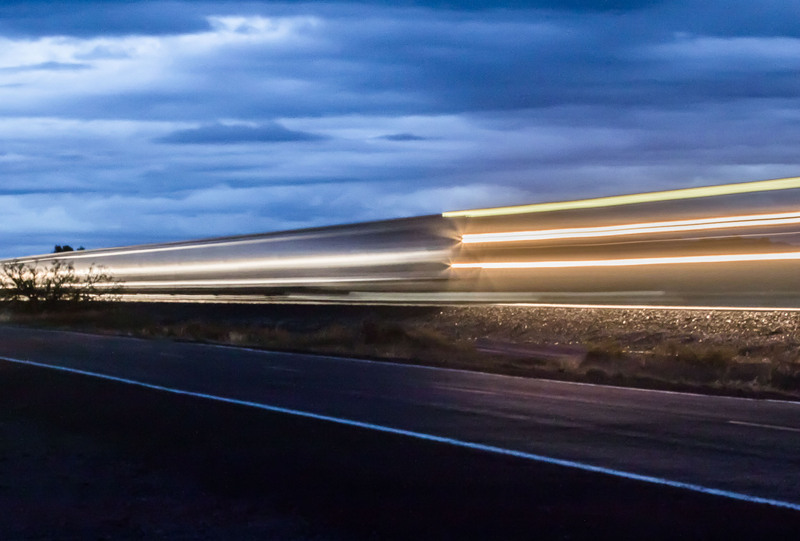 I had plenty of time to set up a camera to try to catch a slow shutter shot of the headlight of the passing freight. I never tried this before and guessed at the camera settings. That didn't work too well but along came a car which illuminated the sides of the freight cars. Bingo! For those who care about such things, I was using a Canon EOS 7D Mark II body in Av mode at f/11, ISO 800, with an EF70-200mm f/2.8L IS USM lens at 70mm. Exposure was 2.5 seconds.